I recently saw this video, The Eyes of a Child, and it's haunted me ever since. Because it's so telling and, in many ways, true to life. 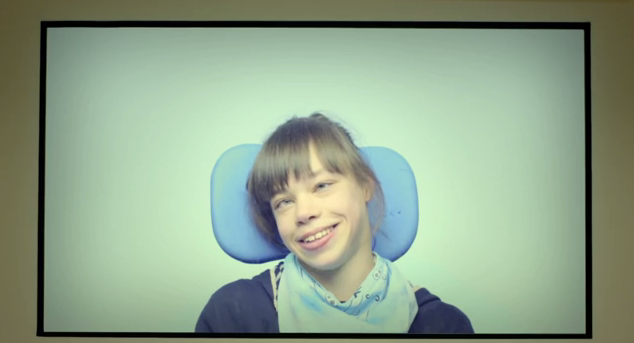 It's produced by the Noémi Association, a nonprofit in France that hopes to change the way society views those with disabilities. The organization invited a group of parents and kids to play an "educational game," and taped the results. To the children, the girl with special needs is just a kid making a funny face to imitate. The adults, however, don't join in. They appear uncomfortable, and clearly think it's wrong to mimic a child with special needs. One dad leans over to check on his child's reactions. If you have a kid with special needs, you get what's going on. Often, adults view our kids as children to be pitied, ones wholly unlike other children—exactly why it seems so "wrong" to mimic them. Although the kids in this video engage, in real life they, too, sometimes keep their distance, unsure of what to make of a child who doesn't seem like them. This video sends a clear message: Please, remember that kids with special needs are still children at heart. They like to play, have fun and enjoy life—just like any other child. Here's how to talk to your kids about ones with special needs. I don't know if the parents saw the girl with disabilities as someone to be pitied. There's a fine line between mimicry and imitation, between teasing and playing. It would not be OK to be mimicking the girl if she herself was not in on the joke. Obviously the first people who made faces were just being silly. But often a person's disability causes them to make "funny" faces that they have no control over. Choosing to not mimic that isn't pity, but humanity. After looking a bit, it appeared to me that the girl was indeed in on the joke. I don't think I would have stuck my finger up my nose though! Just ew. It seems like the girl was fully aware of what was going on, and she was making her own funny gesture. Elisa, perhaps she didn't mean to stick her finger up her nose—it may have been a lack of fine-motor control. Another thing: If your child is the one with special needs/disabilities, don't limit them to only the friends you want them to have. Let them get to know to other kids with different/similar disabilities, who are learning English as a second language, of the opposite gender, of different races and religions, who are older or younger, or who are just different in general. I would probably have no friends if I wasn't open to difference. For us, diversity is a real challenge—Max goes to a school for kids with special needs and participates in programming for kids with special needs. There's not a lot of opportunity to interact with peers w/o special needs, although I've been trying to find an inclusionary program for him. I love the English comments on the video where you see a bunch of people make silly faces: "I'd never mimic a person who clearly can't control her movements!"